This book describes how systems biology, pharmacogenomic and behavioral approaches, as applied to neurodevelopmental toxicology, provide a structure to arrange information in a biological model. Authors review and discuss approaches that can be used as effective tools to dissect mechanisms underlying pharmacological and toxicological phenomena associated with the exposure to drugs or environmental toxicants during development. 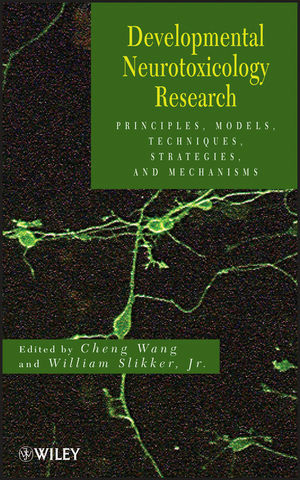 This book presents cross-cutting research tools and animal models, along with applications to the studies associated with potential anesthetic-induced developmental neurotoxicity; the developmental basis of adolescent or adult onset of disease; risk assessment of methyl mercury and its effects on neurodevelopment; challenges in the field to identify environmental factors of relevance to autism; and the strategy and progress of epilepsy research. Cheng Wang is Senior Neurobiologist in the Division of Neurotoxicology at the National Center for Toxicological Research, U.S. Food and DrugAdministration. He is the author of over fifty-five peer-reviewed publications and book chapters. Dr. Wang was awarded the Outstanding Performance Award at the Society of Toxicology 44th Annual Meeting and the 2007 FDA Scientific Achievement Award for Excellence in Laboratory Science. William Slikker, Jr., is the Director of the National Center for Toxicological Research, U.S. Food and Drug Administration. He has over 260 peer-reviewed scientific publications. Dr. Slikker has served as coeditor of several books and is an Associate Editor of the journals NeuroToxicology and Toxicological Sciences. I MODELS, APPROACHES, AND CHALLENGES IN NEUROTOXICITY RESEARCH DURING DEVELOPMENT (Tucker A. Patterson). 1 APPROACHES AND MODELS FOR EVALUATING THE TOXIC EFFECTS OF ANESTHETICS IN THE DEVELOPING NERVOUS SYSTEM (William Slikker, Jr., Xuan Zhang, Fang Liu, Merle G. Paule, and Cheng Wang). 2 SYSTEMS BIOLOGY APPROACHES TO NEUROTOXICITY STUDIES DURING DEVELOPMENT (Tucker A. Patterson, Bradley J. Schnackenberg, William Slikker, Jr., and Cheng Wang). 3 BEHAVIORAL APPROACHES FOR ASSESSING NERVOUS SYSTEM FUNCTION DURING DEVELOPMENT IN ANIMAL MODELS (Merle G. Paule). 4 APPLICATIONS OF UNBIASED STEREOLOGY TO NEURODEVELOPMENTAL TOXICOLOGY (Peter R. Mouton). II EFFECTS OF ANESTHETICS AND THEIR POTENTIAL NEUROTOXICITY DURING DEVELOPMENT (Xuan Zhang and William Slikker, Jr.). 5 NEUROTOXIC EFFECTS OF ANESTHETICS AND POTENTIAL PROTECTIVE AGENTS (Xuan Zhang, Tucker A. Patterson, Merle G. Paule, William Slikker, Jr., and Cheng Wang). 6 PERINATAL RHESUS MONKEY MODELS AND ANESTHETIC-INDUCED NEURONAL CELL DEATH (William Slikker, Jr., Fang Liu, Xuan Zhang, Xiaoju Zou, Tucker A. Patterson, Merle G. Paule and Cheng Wang). 7 EFFECTS OF GASEOUS ANESTHETIC COMBINATIONS DURING DEVELOPMENT (Vesna Jevtovic-Todorovic). 8 PERINATAL ANESTHETIC ADMINISTRATION AND SHORT/ LONG-TERM BEHAVIORAL DEFICITS (Vesna Jevtovic-Todorovic). III THE DEVELOPMENTAL BASIS OF ADOLESCENT OR ADULT DISEASE (Jerrold J. Heindel). 9 DEVELOPMENTAL LEAD EXPOSURE, EPIGENTICS AND LATE ONSET ALZHEIMER'S DISEASE (Nasser H. Zawia and Md. Riyaz Basha). 10 DEVELOPMENTAL TRAJECTORIES OF AUTISM AND ENVIRONMENTAL EXPOSURES—WHAT WE KNOW AND WHERE WE NEED TO GO (Cindy P. Lawler and Alycia Halladay). 11 ACTIONS OF MANGANESE ON PUBERTAL DEVELOPMENT (W. Les Dees, Jill K. Hiney, and Vinod K. Srivastava). 12 EXPOSURE OF THE DEVELOPING BRAIN TO POLYCHLORINATED BIPHENYLS INFLUENCES THE SUSCEPTIBILITY OF THE ADULT BRAIN TO STRESS (Pamela J. Lein, Kyung Ho Kim, Robert F. Berman, and Isaac N. Pessah). 13 A NEURODEVELOPMENTAL ORIGIN FOR PAKINSON'S DISEASE: A LINK TO THE FETAL BASIS FOR ADULT DISEASE HYPOTHESIS (D. Urbach-Ross and M. Thiruchelvam). 14 GENETIC AND ENVIRONMENTAL FACTORS IN ATTENTION-DEFICIT HYPERACTIVITY DISORDER (Angela Baker, Michele M. Taylor, and Jason R. Richardson). IV RISK ASSESSMENT OF METHYL MERCURY AND ITS EFFECTS ON NEURODEVELOPMENT (Michael Aschner). 15 FISH NUTRIENTS AND METHYLMERCURY: A VIEW FROM THE LABORATORY (M. Christopher Newland). 16 NEURODEVELOPMENTAL EFFECTS OF MATERNAL NUTRITION STATUS AND EXPOSURE TO METHYL MERCURY FROM EATING FISH DURING PREGNANCY: EVIDENCE FROM THE SEYCHELLES CHILD DEVELOPMENT STUDY (Philip W. Davidson, J.J. Strain, Gary J. Myers, Conrad F. Shamlaye, Sally Thurston, Maxine P. Bonham, Emeir M. Duffy, Julie M.W. Wallace, Gene Watson, and Thomas W. Clarkson). 17 METHYLMERCURY NEUROTOXICOLOGY: FROM RARE POISONINGS TO SILENT PANDEMIC (Philippe Grandjean, Anna L. Choi, Pal Weihe, and Katsuyuki Murata). 18 OXIDATIVE STRESS AND METHYLMERCURY-INDUCED NEUROTOXICITY (Marcelo Farina, Joa ~o Batista Teixeira Rocha, and Michael Aschner). 19 LEARNING DEFICITS AND DEPRESSION-LIKE BEHAVIORS ASSOCIATED WITH DEVELOPMENTAL METHYLMERCURY EXPOSURES (Natalia Onishchenko and Sandra Ceccatelli). 20 METHYLMERCURY EFFECTS ON NEURAL DEVELOPMENTAL SIGNALING PATHWAYS (Matthew D. Rand). V AUTISM SPECTRUM DISORDERS (Isaac N. Pessah). 21 NEURODEVELOPMENTAL TOXICOLOGY AND AUTISM SPECTRUM DISORDERS (Robert F. Berman, Claire M. Koenig, Michael R. Hunsaker, Isaac N. Pessah, and Janine M. Lasalle). 22 REDOX IMBALANCE AND THE METABOLIC PATHOLOGY OF AUTISM (Richard C. Deth, Mostafa Waly, Christina Muratore, and Nathaniel Hodgson). 23 NEUROINFLAMMATION AND AUTISM (G. Jean Harry). 24AUTISM, PERIPHERAL IMMUNITY, AND POLYBROMINATED DIPHENYL ETHERS (Paula Goines, Paul Ashwood, and Judy Van de Water). 25 AN EMERGING GENE–ENVIRONMENT INTERACTION MODEL: AUTISM SPECTRUM DISORDER PHENOTYPES RESULTING FROM EXPOSURE TO ENVIRONMENTAL CONTAMINANTS DURING GESTATION (Darryl B. Hood, Daniel Campbell, and Pat Levitt). STRATEGIES AND PROGRESS IN EPILEPSY RESEARCH (Merle G. Paule). VI STRATEGIES AND PROGRESS IN EPILEPSY RESEARCH (Merle G. Paule). NEONATAL SEIZURES (Renee A. Shellhaas). 27 EXPERIMENTAL MODELS OF EPILEPTOGENESIS (Hana Kubova). 28 EFFECT OF SEIZURES ON THE DEVELOPING BRAIN: LESSONS FROM THE LABORATORY (Shaun Hussain and Raman Sankar).